Apple dominates the enterprise. Wow... Role reversal. Check out Microsoft's share (second graph). LOL. It's barely visible. 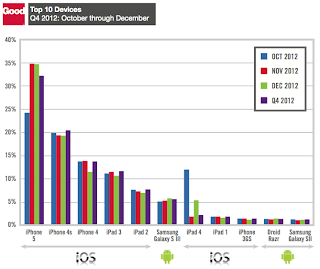 From MacRumors, iOS Dominates Enterprise Mobility Market With 77% of Device Activations. "iOS devices represented 77% of all mobile device activations in the enterprise market in the final quarter of 2012, with the top five slots all occupied by Apple devices..."
"Apple completely dominated the tablet market with 93.2% of activations, with the Samsung Galaxy Tab taking a distant second place. "